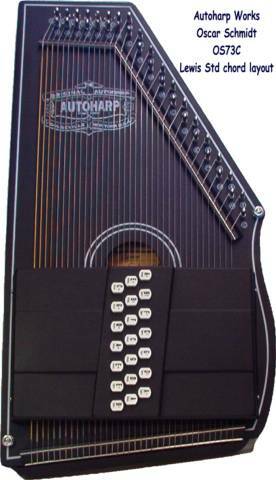 Autoharp Talk • View topic - How do I know if I have a model A or a model B autoharp? 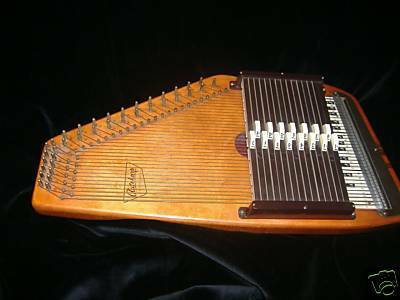 How do I know if I have a model A or a model B autoharp? In practical terms, Model A refers to a string scaling needed for a unique body style and then a unique string set. Model B refers to an instrument style as opposed to model A, but the letter B was used in other ways within model numbering. There is a 15B chord layout and a B style chord bar design. 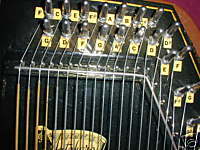 B type chord bars have been used on model A instruments. In most cases, any reference to a model B will intend to describe the type of body style, versus a model A. A prime distinguishing feature of a model A is the string end pins on the end of the frame, the pin cover often missing. The most distinctive feature of the model B is the slotted aluminum string anchor bar set into the top. Any fine tuners would replace that, so the universal distinguishing feature would be the vertical, notched bridge pins in front of the tuning pins. Those are in lieu of the model A type bridge, which would have a wooden platform and metal bridge rod running in front of the tuning pins. Model C is a type of chord bar, not instrument. 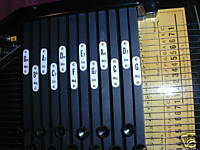 Model D is also a type of chord bar, not instrument. They are both used to describe different sizes of felt. The model B body carrying model C chord bars is referred to as a model C, e.g. OS45C is a model B Appalachian. The C is actually redundant if the model includes the number 21. The reason the C is included anyway is because that type of bar was briefly used on 12 and 15 bar models. Therefore the "C" did not always correspond to having 21 chord bars. The "C" then can be associated directly with the word [C]over, as in chord bar cover with 12, 15 or 21 holes. The OS21C then can make sense as a model number. 21 bars were never offered on vintage model A. However, because bar sets can be added or changed, one must see the body style to say whether one has a model A or B. The bar set is not conclusive. The Model A Reissue is yet another variation. Although it can take a similar type of string, it really is unique in many important ways, differing from both the model A, model B, and Chromaharp. A separate string set is not always offered but should be. Pictures are always best. The following links should be useful in being more certain of what type of instrument body style is under discussion. The objective is to be sure of type of strings or parts availability for example, not to precisely identify a more complicated model number. The question is "do I have a model A or B?" Last edited by admin on Mon Jun 23, 2008 4:13 pm, edited 1 time in total. > I have an old Zimmerman autoharp that has 73 inside.. and Dolgeville. 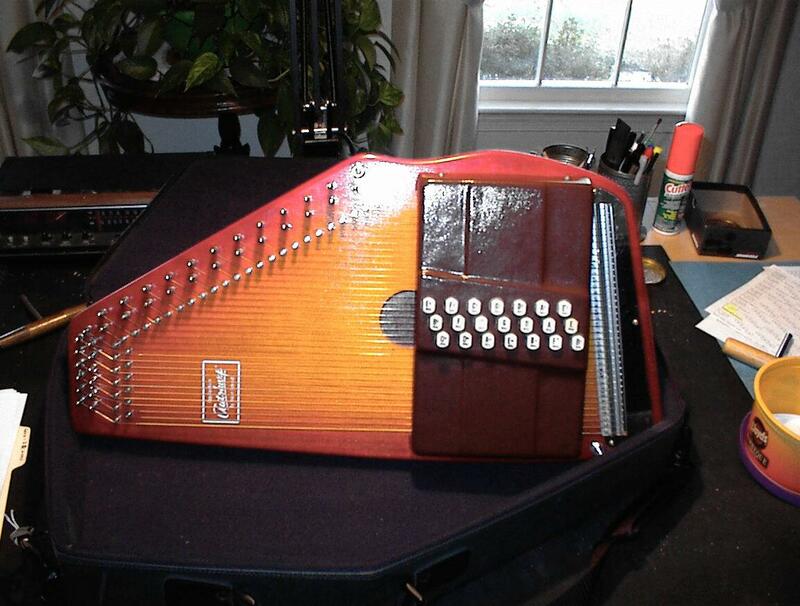 It has 12 chord bars and does not have the "autoharp" symbol on the front. would this be a model A or B or neither? I have attached a picture. I looked at your pictures, and neither really described it. You have to go by the description of the end pins or the bridge in front of the tuning pins or merely contrasting the picture of the model B. Yours clearly qualifies as a model A. The pictures were only examples to show the distinguishing characteristics. 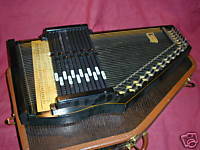 Not all model A autoharps are black. They have various brand names and logos. They were all made using the same patterns and require the same string set. Anything with 36 or 37 strings on it is model A, a model B, a Chromaharp, a Model A Reissue or of the same type as one of them. Yes, within model A there are hundreds of small variations in details. Yours or any model 73 is a model A. 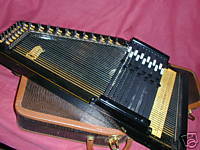 Any 36-37 string autoharp made before 1967 is a model A, all based on the Model 73, the first chromatic. I did not attempt to provide a means of identifying exact model. The "Model A" (or B) is a type more than a real model, sufficiently categorized to get the right string set. I limited the scope to commercial autoharps known to the US. There are actually other brands, one German, and there are luthier designs, all that require additional variations in string sets, some in felt sizes. There are at least dozens of long form model designations more exact than just model A or B, but most of the additional information beyond base model type is irrelevant to selecting the correct replacement parts. 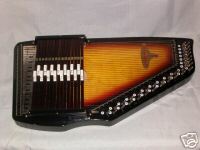 Most of the real detail and variation involves chord bar configurations residing above a strung autoharp body...model A, model B, Chromaharp, or Model A Reissue. Those are in fact four distinct string sets (or should be), with many long form model numbering variations within each, usually depending upon variations in chord selection or type of bars.